A range light when lined up with a similar one behind it will guide a ship safely through a pass sort of like lining up the sights of a gun to get a straight shot. When both lights are lined up one behind the other the mariner knows he’s on the right heading and won’t run aground. Standing ninety-five feet high, this was one such lighthouse. The front beacon stood only thirty-five feet high and was constructed above the keepers house but it no longer exists. It proved impractical shortly after it was built as the channel was always shifting so a mobile lighthouse, one that could be moved, was put into operation in 1884 to compensate for the ever shifting passage. Now only this rear range lighthouse remains along with the keepers house which has been moved to the Harbor Town Marina several miles away. This skeletal style lighthouse is the only one in the state and is an unusual combination of a cast iron crowned with a watch room and lantern room made of cypress.The lighthouse, like most, has its own tale that has become part of its history. Hurricanes have visited them all and when the hurricane of 1898 hit the coast seven years after the lighthouse was built, Keeper Adam Fripp was there trying to keep the light burning. Just as a violent gust of wind tore through the lantern room showering glass everywhere, extinguishing the light he had a fatal heart attack. In his last moments he urged his twenty-one year old daughter to re-light the lantern and keep it burning. Her efforts were successful through the hardship but the stress off it all was just too much three weeks later she also passed away. Ghost stories were sure to follow, which they have, and sightings of the girl with her long blue dress accompanied by traditional wails and sobbing have made their way into the folklore of the lighthouse. 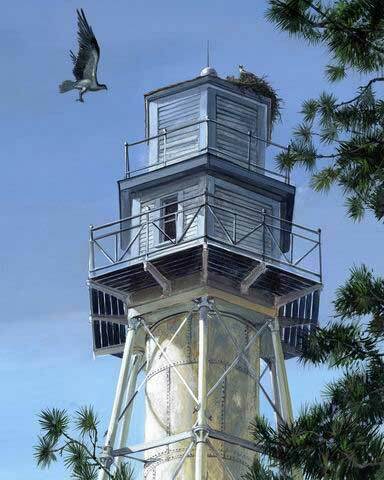 During World War II, the lighthouse served as a lookout tower for enemy ships. Temporary barracks and ammunition sheds, along with anti-aircraft guns were positioned around the tower. Since then Hilton Head Island has become a playground for the privileged few. Security is probably tighter now than when the military was here and the lighthouse stands behind a gated community where they scrutinize every soul that passes their hallowed portals. Almost totally hidden behind tall pine trees on the Arthur Hills golf course at Palmetto Dunes Resort on Hilton Head, this is not an easy lighthouse to get close to but if you do get in, the setting is peaceful and rewarding.The oil house and cistern remain beside the lighthouse and a well maintained golf course now sets the stage for the once important lighthouse. As electric carts wheel themselves past the long iron legs of the tower every few minutes loaded with enthusiastic golfers onboard, visitors driving from the highway will most likely miss it. You can barely catch a glimpse of the top of the lantern room above the trees. I drove by it several times before I could spot it.